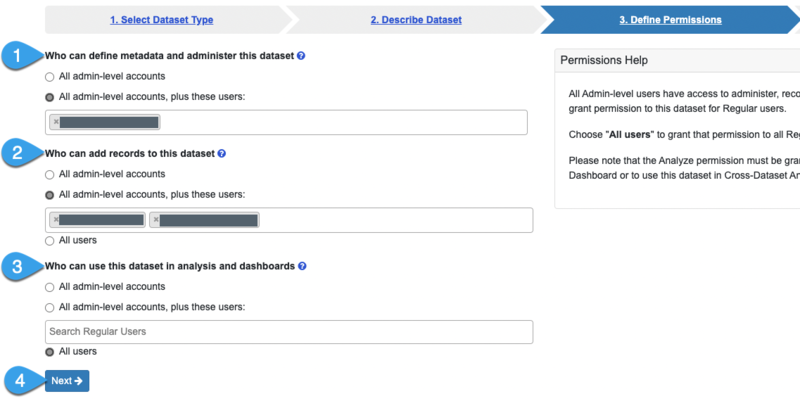 To create a new dataset, go to Admin > Manage Datasets and click the Add New Dataset button. Select Reference from the dataset type dropdown. 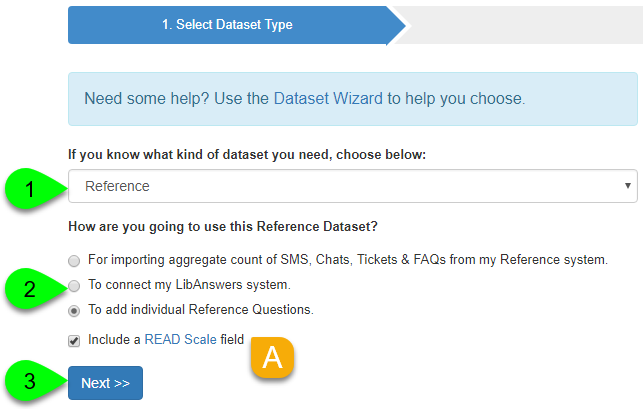 Select how you are planning to use this dataset: importing aggregate data from another system, connecting to a LibAnswers system, or adding individual reference questions. If you choose the option to add individual reference questions, select the checkbox if you'd like to include an optional READ Scale field. Optionally, add a brief description to help explain the purpose of the dataset (up to 255 characters). You may find it helpful to allow users to add more than 1 record at time. When this option is enabled, users can enter multiple copies of the same record at once. This can be helpful, for example, if you received 5 of the exact same directional question during your shift, as you won't have to re-enter the same data 5 separate times. 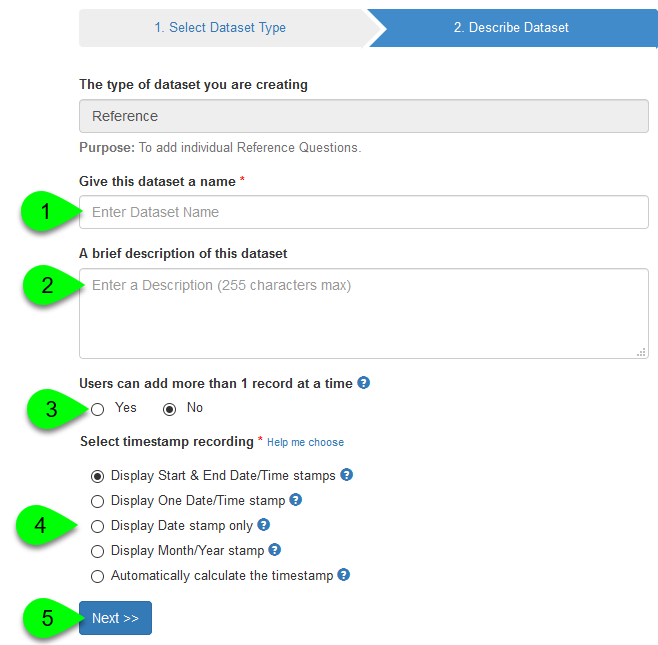 Select the timestamp recording method that you want to use for your dataset. Display Start & End Date/Time Stamps: this will allow users to pick a starting and ending time. This is ideal if you want to analyze the duration of your reference transactions. Display One Date/Time Stamp: this will allow users to select a single date and time. Display Date Stamp Only: this will allow users to select a single date -- not a time. Display Month/Year Stamp: this will allow users to select the month and year, which can be helpful when recording aggregate data. Automatically Calculate the Timestamp: this will record the date and time that a record was actually submitted. Click on the Next >> button to continue. At this point, your new dataset will be created. The following steps will allow you to configure it. Who can define metadata and administer this dataset: this determines who can manage this dataset. By default, all admin users have this permission. However, you can select one or more regular-level users, as well. To select multiple users, press CTRL and click on their names. Each user with this permission will also be able to add and analyze records, as well. Who can add records to this dataset: this determines which users can add new records to the dataset. By default, all admin users have this permission. However, you can select one or more regular-level users, as well. To select multiple users, press CTRL and click on their names. This does not automatically give users the ability to analyze records. Who can use this dataset in analysis and dashboards: this determines who has the ability to analyze this dataset and use it in dashboards. By default, all admin users have this permission. However, you can select one or more regular-level users, as well. To select multiple users, press CTRL and click on their names. Click the Next >> button to continue. You can always edit this dataset later to modify your permissions. Once you configured your permissions, you're ready to finish the setup process. This will vary based upon the type of dataset you're creating: LibAnswers, Manual data entry, or Individual reference transactions. 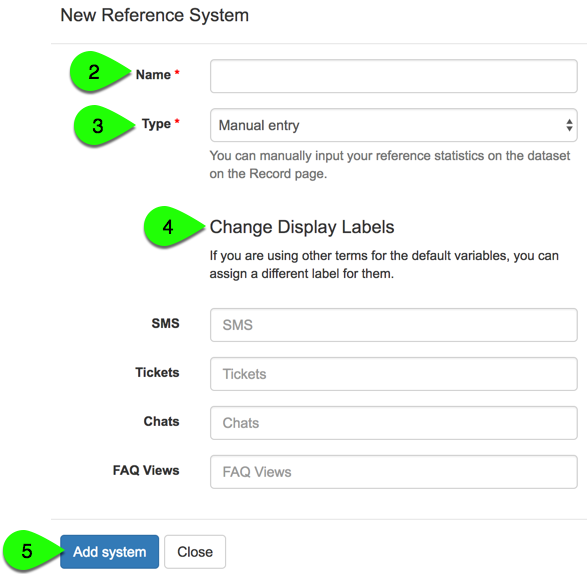 Click on the Add new Reference System to this dataset button. Give your system a name. Select LibAnswers as the type. 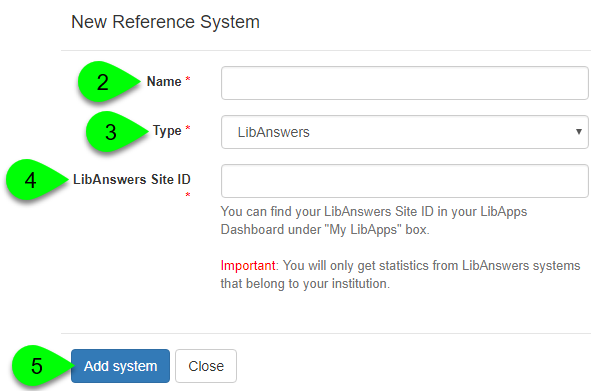 In LibAnswers, under Admin > System Settings > General > Institution Information. Click the Add System button. LibInsight will start fetching your data -- depending upon how much you have, this may take a few minutes to finish. Once connected, LibInsight will automatically fetch data for the previous day each night. For example, the data for January 1 will be available on January 2. Select Manual Entry as the type. Change the display labels if you are using terms other than the default variables. Click the Add System button. If you already have CSV or Excel files you plan to import to your new dataset, you can also use those to more quickly set up your dataset's fields. With this process, LibInsight will grab the field names from the file and add them to your dataset. You will then just need to fine tune each field's data type. Click on the Import from Spreadsheet (in CSV or Excel Format) panel to expand it. Click the Import Fields button. Select the CSV or Excel file you want to upload. Click the Upload and Analyze Headers button. For each field, select the appropriate Type for the data it contains. System: Entered by: this type is intended for fields that indicate who added the record to the dataset. Select the correct variation (First Name Last Name or Last Name, First Name) that matches how the names are entered. System: Start Timestamp: each dataset must have a Start Timestamp field of some variation. If you have the date and time recorded in separate fields, you apply the System: Start Timestamp - Date Part and System: Start Timestamp - Time type to each one respectively. If you only have a single field, then you can select System: Start Timestamp - Date and Time. System: End Timestamp: if your dataset has been configured to have a starting and ending timestamp, use this field type for the field containing the end date & time. Similar to the Start Timestamp, you can split the date and time in separate fields. System: Internal Notes: use this type if you have a field for logging internal notes about a record. Text: this is the best general purpose field type and is ideal for fields with alphanumeric data. Numeric: this is best for fields containing only numbers. Monetary: this is best for fields containing only dollar amounts. Single Select: this is best for multiple choice fields where users can select one value from a pre-defined list of options. Multi Select: this is best for multiple choice fields where users can select one or more values from a pre-defined list of options. Scale: this is best for fields that are capturing ratings on a particular scale. 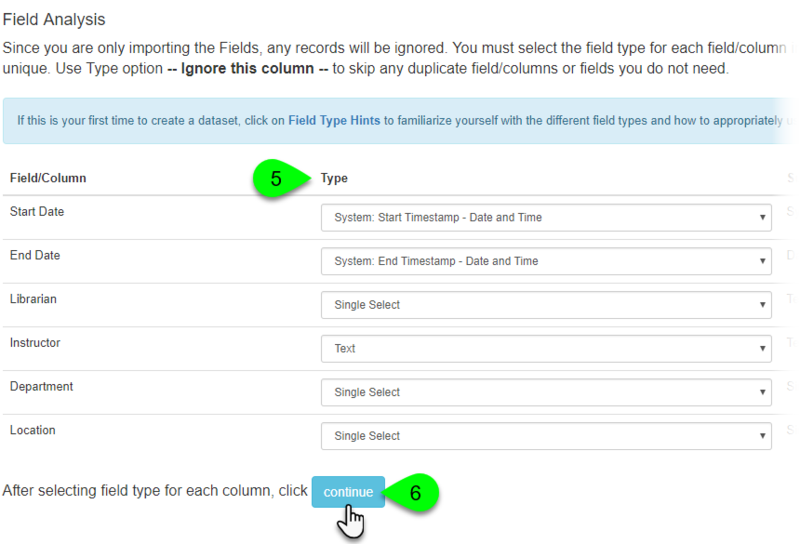 Once you've finished selecting your field types, click the Continue button. Click the Import Spreadsheet to Dataset to process the import. If successful, a confirmation message will appear. 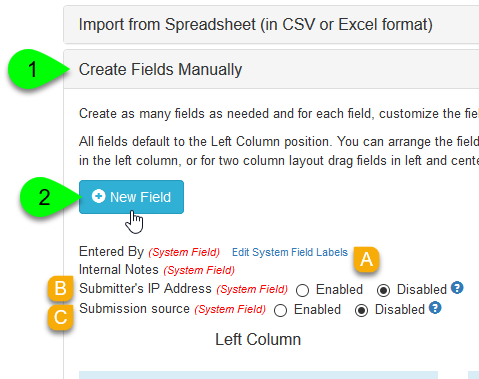 To fine tune your field settings (such as adding instructions, reordering fields, adding multiple choice options, etc. ), click the View the Created Fields button. Otherwise, you can click on the Start Adding Data button to start recording data. Click on the Create Fields Manually panel to expand it. Click on the New Field button. In the Add New Field, select the type of field that you'd like to add. Divider Line: this allows you to place a divider line between fields. This can help visually separate different groups of fields. 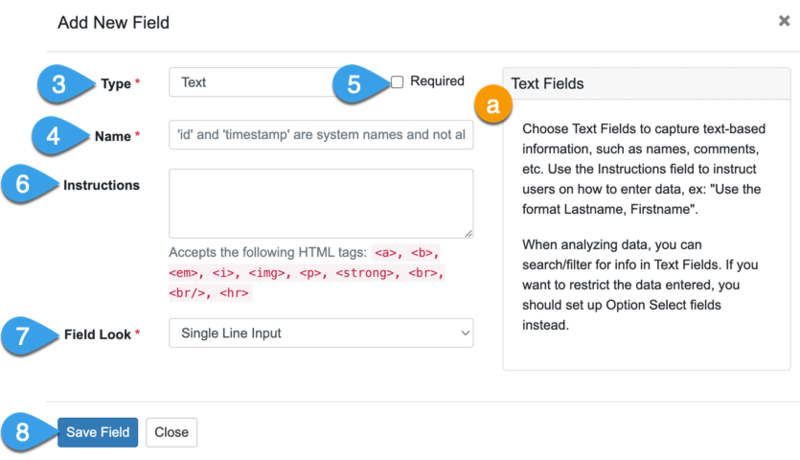 Text Block: these fields allow you to add text between fields or groups of fields, such as headings or instructions. These fields do not accept data. Calculated allows you to perform calculations upon two or more numeric or monetary fields (such as total or difference of two fields). If you'd like to require users to complete this field when recording data, select the Required checkbox. Give your field a Name. This will appear as its label. Optionally, you can add Instructions for the field. This will appear as a Help () icon that displays the instructions when you hover over it. You can use the following HTML tags for formatting your text: <a>, <b>, <em>, <i>, <img>, <p>, <strong>, <br>, <br/>, <hr>. Configure any additional options for the selected field type. Each field type has different options available. The info panel will provide more information about configuring the selected field. Repeat Steps 2-8 to add additional fields.